Did I mention that I have become quite a fan of xkcd. I’m probably late to this and you have probably already heard about it. 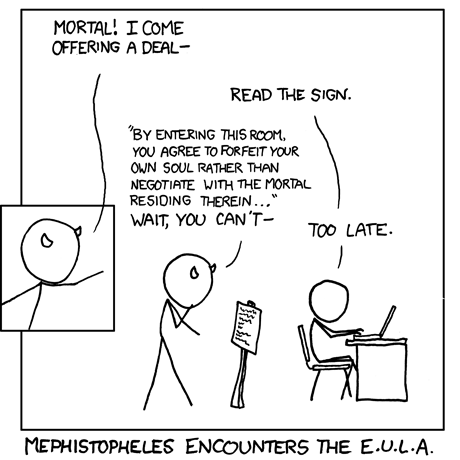 Anyway its an online comic called xkcd and its great. At first glance I thought, well, stick figures ain’t exactly impressive. But then once you read a few of them you quickly develop an appreciation for the humour in them. Particularly if you know, for example, what sudo means. And its also educational. To wit, the third row of one of the more recent strips, reproduced below for your reading pleasure. Somewhat tech legal related. Least enough for me. And no, I have no idea how to pronounce xkcd other than saying the letters.